Really! That’s not a personal opinion, mind you. I mean, I wouldn’t give $500,000 to see Ryan’s face. How can you put a price on a mug like that?? But we did. An innocent photo on Facebook of our director of International Field Operations receiving a tithe check from Alyssa Hostetler, director of our Americus-Sumter covenant partner, led to a slew of comments about Ryan’s facial hair, especially from those who know the founder of our Fuller Center Bicycle Adventure. The remarks were mostly tongue-in-cheek about hair-on-cheek. At the time we posted the photo, we were about $2,000 short of our cumulative fundraising goal for the Fuller Center Bicycle Adventure. After a little bantering about it, we jokingly said that we should not allow Ryan to shave until we hit the $500,000 mark. Then we said it not so jokingly, eliciting a nervous laugh from Ryan. And, indeed, we decided to hold his face hostage. He was not allowed to shave until we hit the $500,000 goal. We called it our “Bearding on Higher Ground” initiative, a play on our Building on Higher Ground motto. It was silly. It was fun. And it worked! 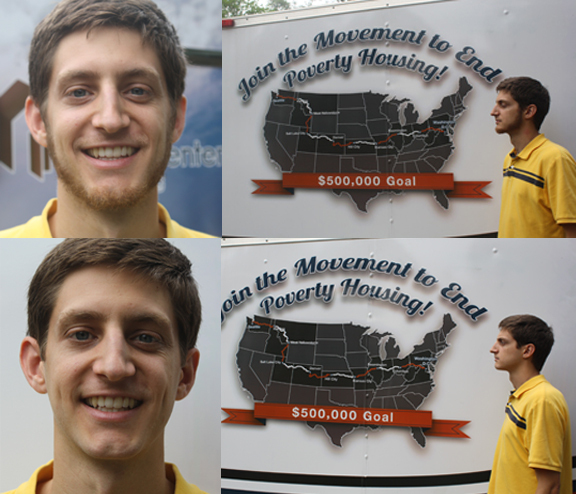 Today we celebrate reaching our $500,000 goal, thanks to Ryan’s face. Apparently, somebody out there wanted to see it. We suspected it was Ryan’s mom who put us over the top, but more than one person must have wanted to see what was under that sage brush Ryan called a beard. And, we’re happy to report that Ryan’s face is now as smooth as a baby’s bottom – and not nearly as dangerous. He got hauled down to Soapy’s barber shop here in Americus for a serious shave. The Fuller Center Bicycle Adventure is a lot of fun involving a menagerie of interesting characters. And Ryan is the interesting character who founded the thing. So, it was only fitting that his face put us over the top. Like the Bicycle Adventure, the now-defunct Bearding on Higher Ground was a little bit of fun that results in a lot of good, fighting the serious problem of poverty housing. What we do through The Fuller Center is serious business. But many of us are determined to carry out our mission with a smile. And we’re glad we can see Ryan’s smile again … even if he does look 12 years old now. Visit the Bicycle Adventure page, which will be updated Sept. 23 with details for the 2012 ride(s). Revisit Bicycle Adventure leader Allen Slabaugh’s Q&A recapping this year’s ride. Congrats to Ryan for his hard work and dedication to raising the $500,000 goal over the last few years. I am glad to have helped out however meagerly that I could along the way. God bless you Ryan and congrats. I’m sure Millard is up there somewhere smiling down.